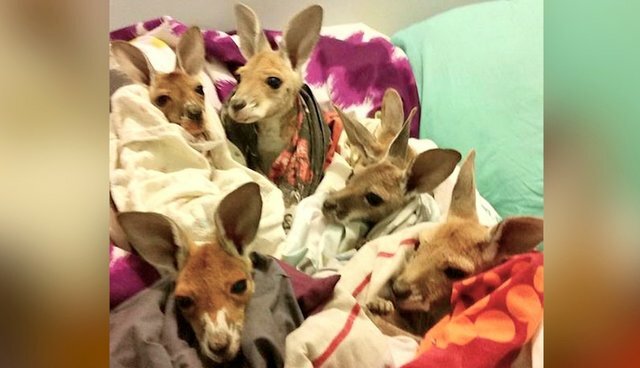 Whenever a baby kangaroo suddenly finds himself without the comfort of a mother's pouch, Tanya Jones, an Australian wildlife rehabilitator based in Alice Springs, is more than happy to swaddle the young kangaroo in a blanket and have him join her in bed - along with all the other kangaroos she tends to. 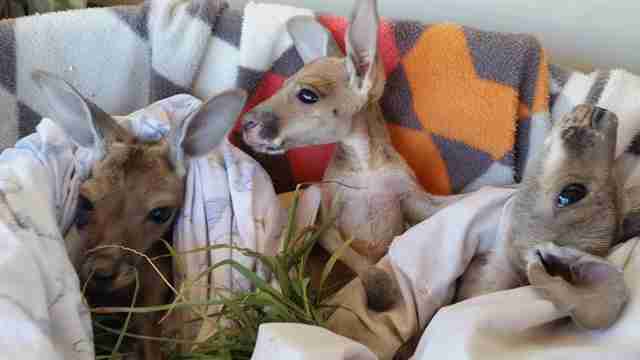 Jones' shelter is a solo operation, and cares for birds, reptiles and other Australian wildlife in addition to rescued kangaroo joeys. 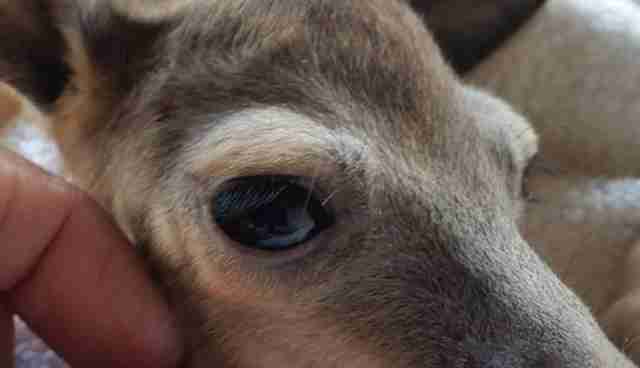 She said that most of the kangaroos currently in her care lost their mothers to hunters, who kill the mothers for their meat. "In the days of old, [members of the Aboriginal community] would only shoot the boys for food," Jones explained. "Now, it does not seem to matter to them anymore. It is so tragic." 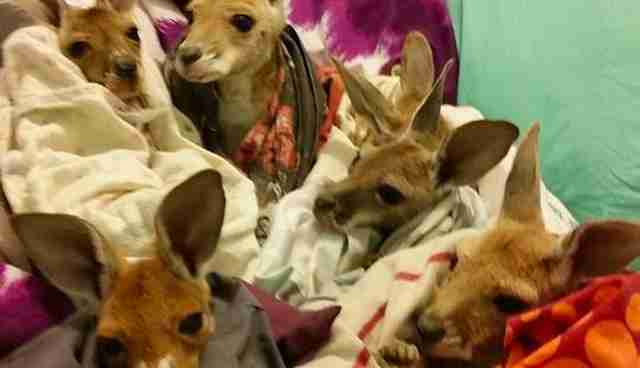 Jones is currently playing mother to eight orphaned babies, all between 3 and 6 months old. Watching over every single one is a full-time job. "I am with them constantly, 24/7, as this is what is required to make them feel safe and secure in their now-changed world," Jones said. 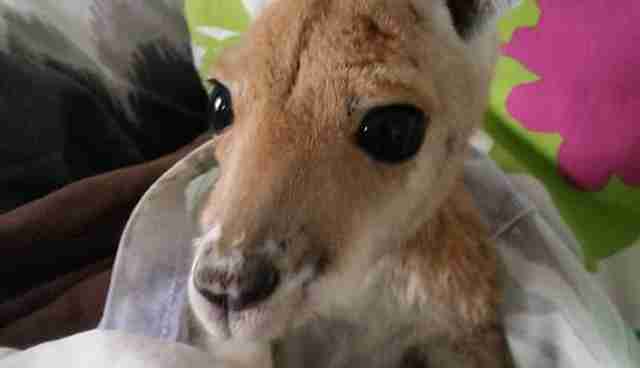 Her days start at 5 a.m., and the joeys, depending on age, have to be fed every two to four hours. But Jones is a pro - after all, she's been running and funding her own shelter for 10 years now. "I have been looking after wildlife since I was a little girl," she said. "My mom got me into it at a young age, as she has always saved animals." 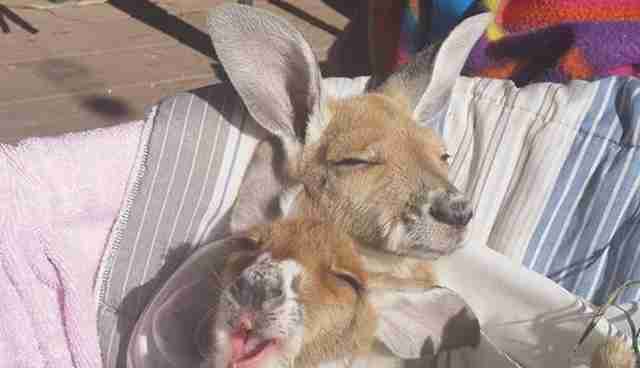 The sweetest thing about Jones' rescued kangaroos is that they don't only thrive from the comfort she gives him, but also from each other's company as an adopted family. 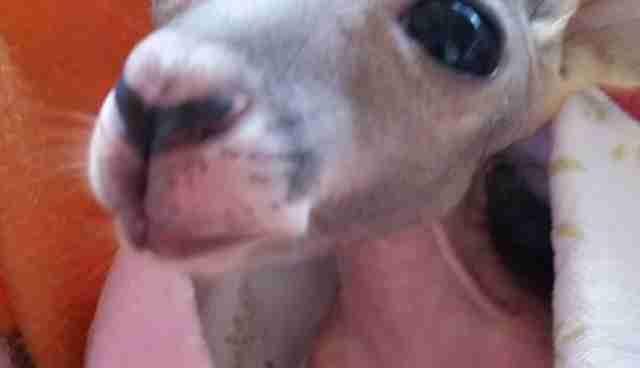 Such was the case with Liana, a young kangaroo who arrived sick at Jones' shelter in early May. She grew stronger in the company of her fellow orphaned "sisters," Rarda and Isabella, and she slowly regained her health, as well as a hearty appetite. 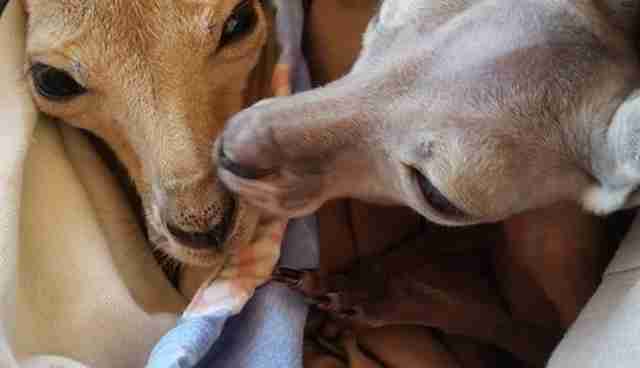 And Isabella in particular took to Jacob, one of the male joeys, and loves adorning him with kisses. 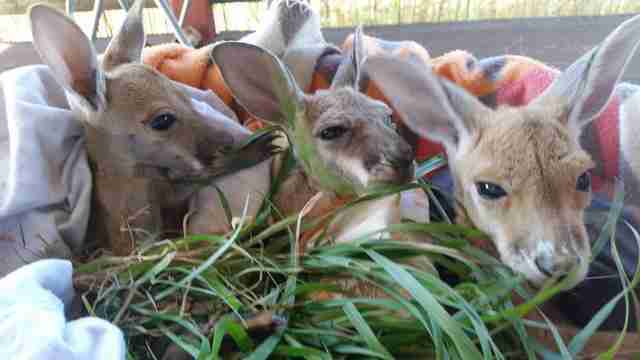 "All of the joeys get along and love each other very much," Jones said. "They take comfort from each other." 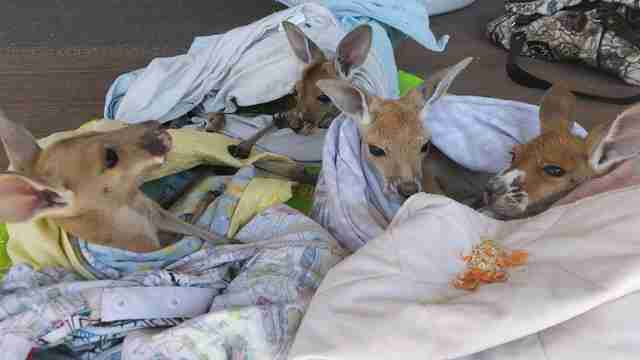 Jones said she cares for each joey until they're about 2 years old before releasing them back into the wild. As much as Jones adores her "babies," she said, she fully understands that they'll only be able to live their best lives in the bush. 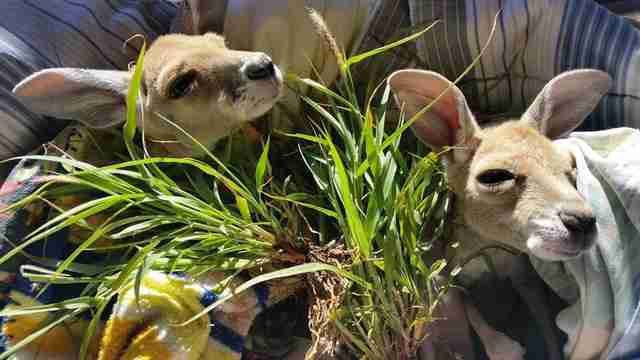 "The best part for me about caring for native Australian wildlife is setting them free," Jones said. "This is my greatest joy. Real love is free love, and free love is real love." 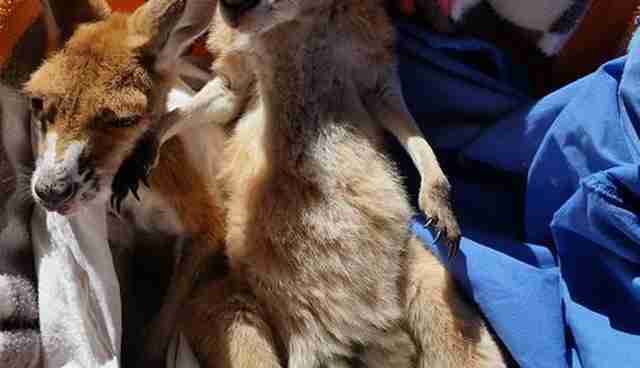 You can keep up with Jones and her 'roos on Facebook.